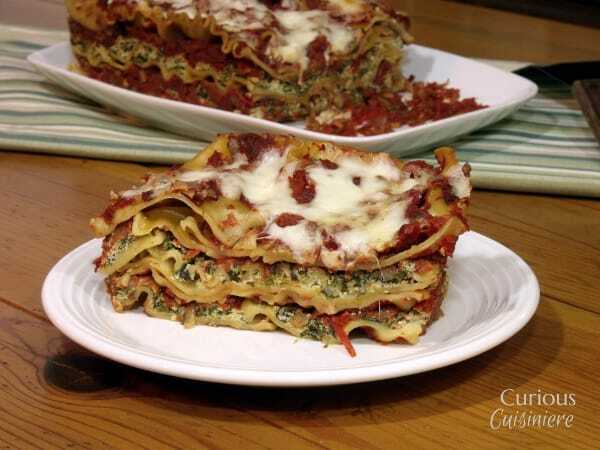 This Mushroom Spinach No Boil Lasagna is packed with veggies and creamy cheese, making for one hearty and comforting meal. 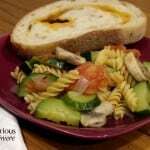 Make it ahead of time to make dinner a breeze! Lasagna really is the mother of all baked pasta. 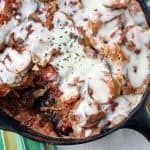 If you didn’t know what a ‘baked pasta’ was (ok, maybe it’s just me that was clueless for a while), all someone would have to say is ‘lasagna,’ and you’d get the picture. 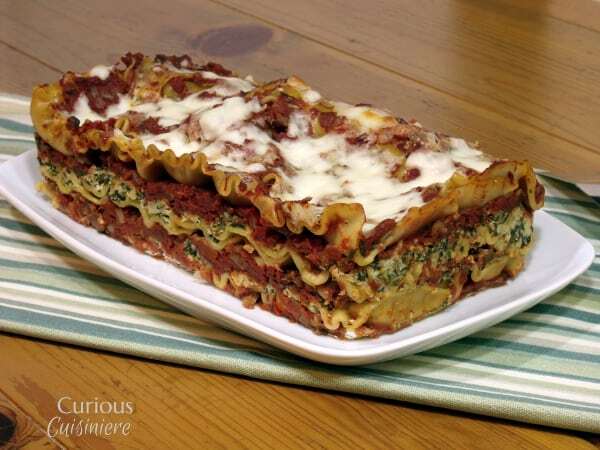 But, while other baked pastas (like our Baked Ziti with Meatballs) tend to let their ingredients be tossed together willy-nilly, lasagna likes to have a bit of structure. The structure of lasagna comes from a layering of the three key elements: the sauce, the cheese (sometimes a cheese sauce), and the noodles. The cheese layer is often made up of ricotta cheese mixed with a beaten egg. 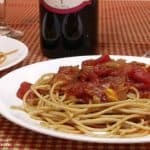 This is a similar mixture to what you would find in stuffed shells, cannelloni, or other stuffed pasta dishes. 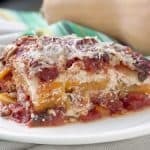 The eggs in the cheese mixture work as a binder for the cheese as it cooks, helping the lasagna to hold its shape and keeping the cheese from separating. In addition, it makes the cheese layers creamier and smoother than they would be without it. When it comes to lasagna, I hate boiling the noodles even more than with other baked pasta dishes. It’s not just the extra pot here. Par-boiled lasagna sheets can be fragile and always tear and rip before I can get them arranged properly. 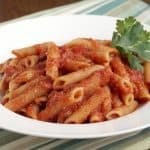 But, as with our baked ziti, when baking dry pasta, the moisture of the sauce is key and the same three keys to controlling moisture apply here too: covering while baking, uncovering to finish, and resting. This particular recipe creates a bit of a drier lasagna. It holds its shape well and doesn’t ooze sauce all over. While we do like a saucy and moist lasagna, this one is a nice change in texture (Hello crispy edges!) and the deep flavor of the tomatoes really shines through. We love the combo of mushrooms and spinach as the veggies for this baked pasta dish. 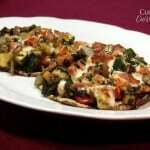 The mushrooms add a depth and the spinach is the perfect complement to the tomatoes and cheese. 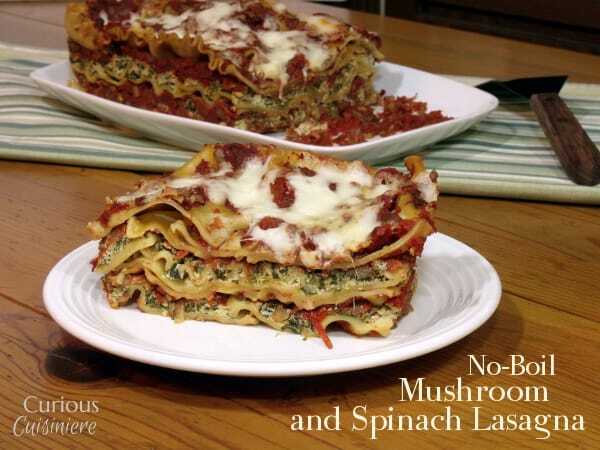 This Mushroom Spinach No Boil Lasagna is packed with veggies and creamy cheese.! In a large skillet, heat ½ tsp butter. Add onions and garlic and sauté over medium heat until they begin to caramelize, 8-10 minutes. Add the remaining ½ tsp butter to the skillet along with the diced mushrooms and salt. Sauté until the mushrooms begin to sweat and soften, 2-3 minutes. Add rosemary, thyme, sage, and red pepper flakes. Mix to incorporate. Pour the wine into the skillet and scrape up any bits of onion that have stuck to the bottom of the pan. Add the tomatoes and mix well. Simmer over medium-low heat, stirring occasionally for 3-5 minutes. 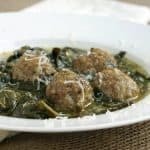 In a small bowl mix ricotta, chopped spinach, Parmesan cheese, and beaten egg. Set aside. Spread 1 cup of sauce in the bottom of a 9x5 loaf pan (or 8x8 baking dish). Layer 1/3 of the noodles over the sauce and top the noodles with ½ of the cheese mixture. Continue with 1 cup of sauce, 1/3 of the noodles, and the last ½ of the cheese mixture. Finish the layers off with 1 cup of sauce and the last 1/3 of the noodles. Top the noodles with the last 1 cup of sauce. Cover the dish with aluminum foil and bake for 1- 1 ½ hours, until a knife inserted into the center of the dish slides in smoothly. Remove the foil and top the lasagna with the mozzarella cheese. Return the dish to the oven and bake, uncovered, until the cheese is melted and golden, 10-15 min. Remove the lasagna from the oven. Let it stand on the counter, tented loosely with aluminum foil, for 10 minutes before serving. Need to feed a crowd? Double the recipe to fill a 9x13 baking dish. DISCLOSURE: We were provided with a sample of Red Gold Tomatoes featured this post, however we were not compensated for our time. As always, all opinions are our own.